It’s no secret Mercedes is preparing its next generation of G-Class – the go-anywhere luxury SUV that started life nearly 40 years ago as a military truck. Spy shots and rumors have surfaces regarding the upcoming Geländewagen, or G-Wagen, but no news has surfaced about Mercedes’ sportier version built under the AMG badge. That has all changed now thanks to our lucky spy photographer who captured a camouflaged test mule running around the hills of Spain. The new generation of G-Wagen, even sans-AMG badge, is visibly larger than the outgoing model. Its track is wider, its wheelbase is slightly longer, and the overall height seems to be slightly increased. All this in the name of interior comfort and on-road driving dynamics, rumors suggest. The current G-Wagen is notorious for its cramped, outdated interior. Mercedes is undoubtedly ready to update its most iconic and longest-lived platform.Concerning the AMG version seen here, it’s wearing a taller bumper with larger air scoops, AMG-specific wheels, and wider fenders that accommodate the wider tires. We’ve compiled all the rumored into a speculative review, so keep reading for the all the info. If the appearance of a vehicle hardly changes for almost four decades, yet its popularity remains unbroken, the manufacturer has done everything right. The G class is such a stroke of luck: its design demonstrates timeless distinction. The Mercedes AMG G63 is a part of this tradition, setting its own accents with subtle design modifications. Its face is characterized by the AMG radiator grille, as well as prominent bumpers with large air intakes. Another feature that is characteristic for the AMG model is the fender flares. Stainless steel running boards and protective strips on the sides containing inserts with a brushed aluminum look complement the exclusive exterior. Other signs of distinction are the “V8 BITURBO” lettering on the front fenders and the Mercedes AMG G 63 nameplate on the rear door. Red brake calipers and the 20-inch wheels round off the expressive exterior. This SUV is boxy, absolutely not aerodynamic and be used as a battering ram on other vehicles. The indicators on top of the front fender. When was the last time you saw this. They still managed to put a LED DRLs strip below the headlamps. This looks more like the armoured cars than a daily use one. Even the exhaust pipes is exclusive where you have twin pipes on each sides of the car below the side steps. Now that is an out of the box thinking design. The G63 AMG looks different from anything on the road, with its boxy, old-school design. However, the Alien Green colour looks fabulous in real and livelier than what it appears in the pictures. The matte-black five spoke 20-inch alloy wheels and the carbon fibre ORVMs compliment the looks very well. This SUV is big, tall and quite intimidating. Open the door and feels as if you have opened a bank vault, such is the build.The G63 is a ladder frame chassis, hence the cabin is pretty high and even if you are six feet tall, you need to use the footboard as a step to climb in and settle into its superbly contoured seats. The seating provides a commanding position and has excellent all round visibility, except for the rear. The space inside is average. When you open the doors to step into the interiors is when you realise that even the doors have that old-school feeling to them. Unlike other Mercedes’ where the doors are quite heavy and close with a loud thud, this one has pretty light and thin doors that close with a thunk. We’re pretty sure that Mercedes must have made the body structure equally safe in this car as compared to its stable mates. The interiors of the G63 AMG are a revelation. They are quite modern when it comes to design and tech. The all-black dashboard has a simple design and the AMG steering wheel looks classy. There is also an AMG interior trim package and lots of carbon fibre bits on the inside. The number of storage spaces and cubby holes is decent and there are not too many of them. The instrument cluster is big in size and displays a lot of information. The centre console gets a 7-inch infotainment system which has the usual functions like SDHC card slot, Bluetooth, USB and AUX-in connectivity and also 10 GB of storage space. The upholstery is finished in black with contrast stitching in green colour matching the exteriors of the vehicle. The roof is finished in Dinamica black microfibre. The sunroof has a tilt and rollback function but it misses out on a cover. So when you press the sunroof button, the roof opens up completely while in other cars there is usually a cover that opens first and then the actual sunroof. The Harman Kardon Logic 7 sound system gets 12 speakers and gives out very good sound quality. There is also a rear seat entertainment system on offer. The front seats get a lot of adjustment options and finding the perfect driving position is easy after playing around with the buttons for a few minutes. The vehicle also gets a Memory Package for the front seats and head restraints, steering column and exterior mirrors while parking. Overall visibility from the driver’s seat is excellent and the ORVMs are also generously big in size. All the seats are very comfortable but space is lacking at the rear. The rear seats has a 20:40:20 split functionality. The boot is large enough to stuff whatever you want to. The G63 AMG also gets a reversing camera with PARKTRONIC feature that includes 10 ultrasonic sensors – six and four in the front and rear bumpers respectively. The system displays the surroundings on the screen on the dashboard and also on the roof liner at the rear which is a nice touch. The SUV gets a THERMATIC climate control system with 2 climate zones and it works brilliantly and cools the cabin fairly quickly. The G63 AMG comes with a 5.5-litre twin-turbo V8 engine burbles to life when you turn the key. It was in 2012 that Mercedes-Benz upgraded this 36-year old SUV from G55 to G63 enhancing its power from 500bhp to 537. There is immense torque in this engine and the SUV rocks if you press the throttle when at standstill. Something like how an American muscle car would have reacted. The side-twin exhausts make the length shorter and the exhaust note gruntier. This engine is a monster and only a not-so-sane person can think of this. When the world is moving on to curves, someone willing to risk it made this boxy SUV and the results have been marvelous. Step in behind the steering wheel and you will be astonished to see how easy it is to adjust the steering position and despite a V8 under the hood, the bonnet feels compact and one can see the left edge as well. It never feels like a large SUV when you are driving. The steering wheel is lighter than the G55 and even the turning radius is short. It is very easy and convenient to drive in city and on the highways, its ooh-la-la. You cannot stop grinning the moment you put your foot down. The G63 AMG makes a strong case for it and handles tight turns with ease. What is astonishing is how this heavy SUV – with three sets of differential locks, which can put most of the other SUVs to shame while off-roading – can even throw around its weight and make a strong case for itself. This SUV is just the perfect one when it comes to drivability and even the handling. It can accelerate like a sports car, turn like one and if you want to cruise, it mutes its exhaust, especially when you are cruising with minimal throttle input. This is a tall SUV and it handles brilliantly. So, it has to have stiffer ride than other Mercedes-Benz products. The G63 AMG feels a tad stiff during off-roading too. The on-road and off-road capabalilty of the Mercedes-Benz G-Class G 63 AMG Crazy Colour Edition is assisted with the drive mode selection feature of ECO and Power modes. The smooth steering with AMG performance steering wheel with AMG carbon-fibre trim, steering-mounted controls for music system, cruise control and the adaptive Bi-Xenon headlights assure a comfortable driving experience on long stretch roads. The permanent all-wheel drive mechanism is provided with differential gear and differential locks that are electrically engageable while in motion assist for smooth changes in driving modes during off-road usage. This Mercedes-Benz G 63 AMG has been equipped with quite a number of comfort features, which comprise of a powerful air conditioner unit with automatic climate control and air quality control along with rear AC vents, a multi functional power steering wheel that can be adjustable, front and rear power windows, adjustable seats , rear seat adjustable headrests, rear seat centre arm rest with cup holders for added comfort, front center console cup holders, folding rear seats, front and rear heated seats, remote trunk lid opener, a remote fuel lid opener, luggage compartment lamp, a rear reading lamp, height adjustable front seat belts and many more such features.The list includes a total of six airbags that includes front, side as well as curtain, a set of Bi-Xenon Headlamps, seat belts with 3-point design, an Anti-lock Braking System and Brake Sssist, an ISOFIX child seat fixing points , electronic stability control, central locking with keyless entry and power door locks, door open warning, engine immobiliser with an anti theft alarm, cruise control, parking sensors, seat belt warning lamp and many other such important safety aspects as well. 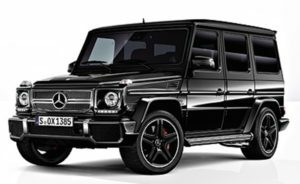 Look at the G63 AMG objectively and you’ll probably see it as a has-been that’s just trying to fit in the modern world. Performance is epic but on ride, dynamics and overall finesse, the G63 can’t match up to today’s SUV standards. In fact, Merc’s own monocoque-bodied ML63 AMG and GL63 AMG are far more complete as performance SUVs go.Experience one though and in all likelihood, you too will be sold on the G63 AMG, flaws be damned. There’s just something inherently desirable about an old-school, rugged SUV with such an excess of power. True, the G63 doesn’t make for the most rational of purchases but then again, performance cars in India rarely ever do. Ahem, just the small matter of price. The G63 AMG Crazy Colour edition costs an equally crazy Rs 2.17 crores (ex-showroom, Delhi). You could save yourself some hard earned money if you opt for ‘standard’ white or black G63s that retail for a more digestible Rs 1.96 crore. Either way, you can be assured of owning an SUV like no other and one that’s unlikely to go out of fashion anytime soon.